#1 most deadly case last week — melanoma on the bottom of the foot. #2 most deadly case last week — melanoma on the lower leg. #3 most deadly case last week — melanoma on the face. Now, most of this has to do with how advanced the melanoma was when it presented, but there is an important lesson here. Alot of people will poo-poo a dark or unusual lesion on the lower body, since they don’t feel like the lower body gets alot of sun exposure. Melanoma can happen ANYWHERE! The most common location for women to develop melanoma is the legs (as illustrated above — patients #1 and #2 were women). If your dermatologist doesn’t make you #getnaked, find another one. When you come to me for a full body skin examination, I check everywhere (unless you absolutely decline, I will respect your privacy!). But seriously, your dermatologist should be checking in between your toes, looking through your scalp, and checking where the sun doesn’t shine! I used to have a teacher in dermatology residency that would drill into us that if we weren’t checking the buttocks, we had not finished our full body exam. It was a little embarassing when she asked in front of the patient, but the point was well taken. Bob Marley died of melanoma on his foot. In truth, some melanomas are not sun induced (how would sun get to the bottom of your foot? 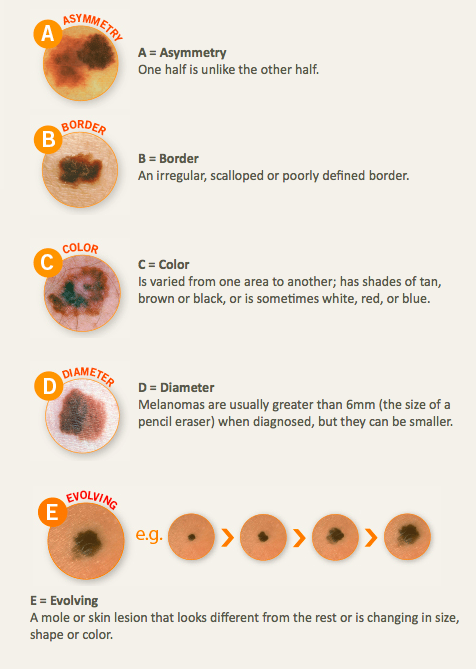 ), and these melanomas are more similar to other cancers that happen spontaneously. Therefore, everyone should come in for an annual skin exam, even people with dark skin. A stands for asymmetry — if a mole is asymmetrical. One half is not like the other half. B stands for border — if the edges are ragged, not smooth. C stands for color — if there are more than 1 or 2 colors present. D stands for diameter — if it is more than >6 mm or the size of a pencil eraser. E stands for evolution — if any mole is changing. If you feel that any of your moles have met these criteria, don’t panic, but please do see your dermatologist for a professional evaluation. As an aside, you should never feel funny going to the dermatologist to check any spot on your skin. The spot in question may be benign, but just being in the office may help identify other problem areas. More often than not, the worrisome spot is fine, but I may subsequently locate an inconspicious lesion that is a problem (potentially a skin cancer). This was the case in patient #3. 90% of melanomas are curable if caught early. Take care of yourself and your family — #getnaked and check your skin!